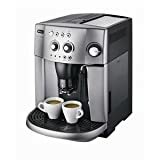 220-240 Volt/ 50-60 Hz, Fully Automatic Espresso Coffee Maker, 14/ 72h Coffee-grounds container capacity (n°), Cappuccino System mixes steam, air and milk, producing a rich, creamy froth for great cappuccinos, Capacity indicator, 1.8 L Removable water reservoir, 200g Beans container capacity, 1450 Watts Input Power, Automatic shut-off, Electronic steam and coffee thermostat, Electronic temperature control, Pre-brewing, Can be used with either coffee beans or ground coffee, Rinse and decalcification auto-programmer, Empty water and bean container indicator, New silent integrated coffee grinder with 13 grinding settings, Two cups of coffee with a single brewing, Removable brewing unit with variable capacity, Adjustable Water & coffee quantity, Adjustable coffee dispenser for varying cups size, Programmable water hardness, Cup holder, Removable drip tray, New patented thermoblock: to grant the espresso at the ideal and constant temperature, Adjustable steam emission. This product is made to use overseas. This will not work in the US.